ARE WE GONNA DRINK THIS TIME? YES, RAMBO. YES. Some of you may remember--or may even remember playing--my wildly successful Angels in America drinking game. Well, with Sylvester Stallone mounting his latest 80s icon resurrection, RAMBO, this weekend, it seems like it's time to start drinking again. Sure, there probably isn't enough alcohol to make you dumb enough to see RAMBO, but now you have an excuse to try. Someone mentions John Rambo's green beret background: Nod serenly and knowingly drink and say, to no one in particular, "They brought this on themselves. 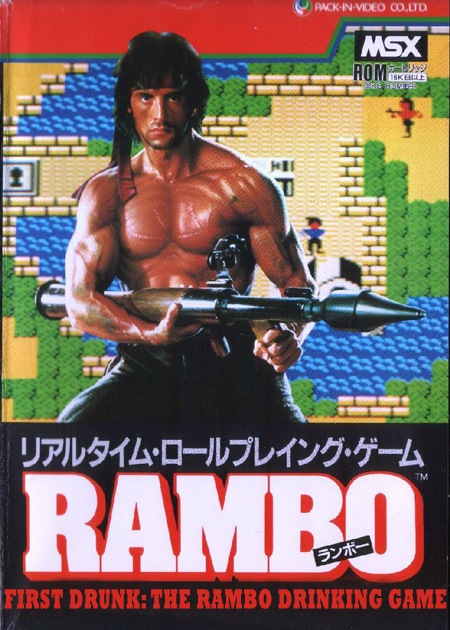 They created John Rambo." Rambo catches a knife and throws it back at the thrower: Throw your drink at your neighbor and yell, "That was for our lost innocence!!" Rambo uses an enemy as a human shield: Pour everyone's drink into the least-full glass and make that person drink a "suicide"